Sybil Welsh, Adviser, Corporate Relations Officer, ECCB; Telojo Valerie Onu, Managing Director, Quintessence Consulting; Nicole Brand, SBFIC; Timothy N.J. Antoine, Governor, ECCB; Dr Jurgen Engel, SBFIC. Governor of the Eastern Caribbean Central Bank, Timothy N J Antoine, met with representatives of the Germany–based Savings Banks Foundation for International Cooperation (SBFIC) on 3 May, to discuss the start of a project initiated to strengthen the financial sector and improve access to financial services in the ECCU. The project is aimed at improving access of Micro, Small and Medium–Sized Enterprises (MSMEs) to financial services in the ECCU and strengthening their financial and business literacy skills. 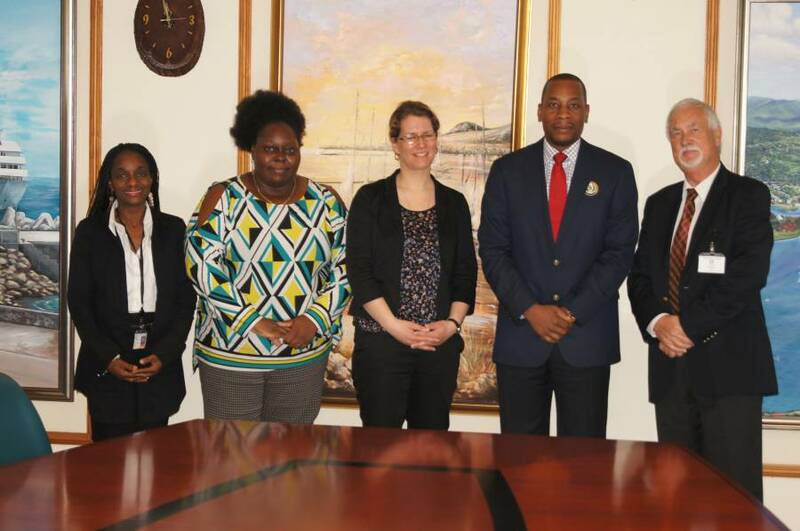 The Governor’s meeting with Nicole Brand and Dr Jürgen Engel of the SBFIC was the first in a series of consultations with stakeholders at the start of the 2–year orientation phase of the project. Other members the ECCB staff, who are involved in the project, and Telojo Valerie Onu, Managing Director, Quintessence Consulting also attended the meeting. During the discussions, Governor Antoine encouraged the SBFIC to be cognizant of the enabling environment and appropriate legislation to facilitate small business development within the single economic and financial space. He also highlighted the importance of small business incubators and the necessity for national entrepreneurial champions to spur private sector development. The Governor reconfirmed the Central Bank’s commitment to assist with leveraging this project to ensure that MSMEs gain practical benefits within the context of the single economic and financial space.